*Event is free of charge and open to the public. 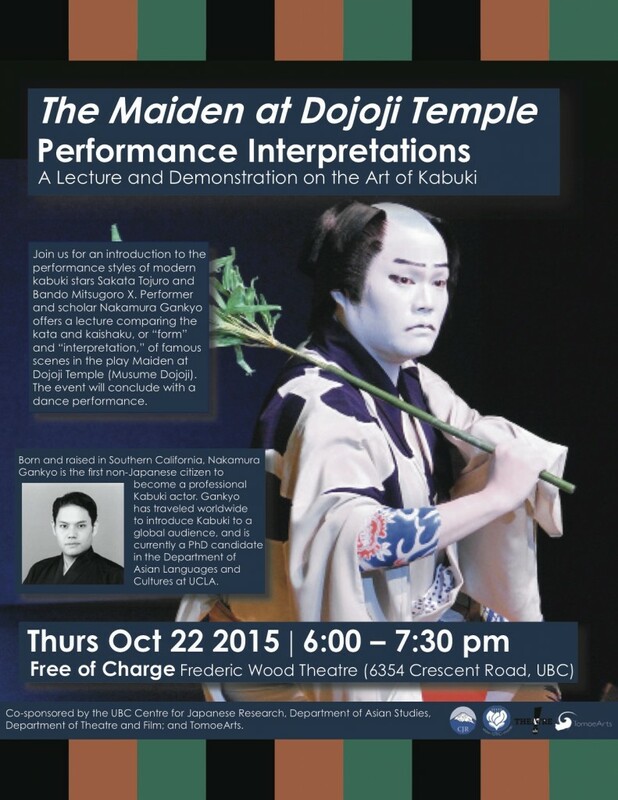 Join us for an introduction to the performance styles of modern kabuki stars Sakata Tōjūrō and Bandō Mitsugorō X. Performer and scholar Nakamura Gankyō offers a lecture comparing the kata and kaishaku, or “form” and “interpretation,” of famous scenes in the play Maiden at Dōjoji Temple (Musume Dōjōji). The event will conclude with a dance-performance. Born and raised in Southern California, Nakamura Gankyō is the first non-Japanese citizen to become a professional Kabuki actor. Gankyō has traveled worldwide to introduce Kabuki to a global audience, and is currently a PhD candidate in the Department of Asian Languages and Cultures at UCLA. Co-sponsored by the UBC Centre for Japanese Research, Department of Theatre and Film, Department of Asian Studies; and TomoeArts.